Getting Naked | Does This Font Make Me Look Fat? I’m posting a picture of my desk. This is a little—no, a lot—like getting naked in front of strangers. Okay, I admit I cropped out the worst of it, but even I look at it and make a judgment about that writer. What a mess; what disorganization. How can she ever get anything done? What does her sock drawer look like, I wonder? Heck, I bet she doesn’t even have a sock drawer. Probably just a sock basket and throws all the socks in directly from the dryer. Okay, that was me, but it was a long time ago and I had four kids. Who had time to mate? Oh, stop…stop right now! 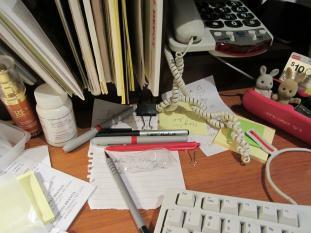 My desk is an archeological dig—muddled layers that accumulate like debris in a medieval kitchen midden. (Tip to other writers with desks like mine—use colored paper between the important layers.) Sometimes the piles are relegated to the floor and occasionally I sit on important items because it gets my attention especially if it’s 30 pages or more. Otherwise, it’s easy to overlook something until I stand up. Where others file, I pile…on the twin bed in my office, on the dining room table, any flat empty surface is game. There is a pile for each volunteer job I do in my local writing community, a pile for each writing project which at the moment includes two rewrites of TV scripts, a feature movie script, early notes for a novel and the play for the Avalon. Oh, and the renewals for Eastern Shore Writers Association and their member directory that I am compiling (deadline Sept 23), and Bay to Ocean Writers Conference stuff. But it all seems to get done and on time. I know the things I need to accomplish each day although how people got along before Post-It Notes is a mystery. I used to make a list every morning of what I needed to do that day, and I always put a couple of things at the top I’d already accomplished so I could cross them out. It made me feel better. My disorganization is only perception. I know what is in that pile to the left of my keyboard. I do look through it every couple of days to make sure there isn’t something I’ve forgotten. And the trail of Post-it Notes from my office to my kitchen cupboards to the door to the garage and the steering wheel of my car are crucial. This entry was posted in Uncategorized and tagged Avalon Theatre, Bay to Ocean Writers Conference, Eastern Shore Writers Association, Mala Burt by Mala Burt. Bookmark the permalink. My wife also has empty horizontal space disease. She sees an empty horizontal space and has to fill it. There should be a support group. EHSD support group. Love it!